Time to check your bank account, Roger Ailes. 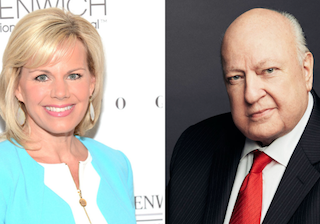 Fox News parent 21st Century Fox has begun settlement talks with Gretchen Carlson, who is suing former Fox News CEO Roger Ailes for sexual harassment. While that by itself is not surprising, some details from a Vanity Fair report are. First off, 21st Century Fox wants Ailes to pay at least a portion of the settlement out of his own pockets. You wouldn’t think Ailes would go for that, considering he has denied all the accusations. And that leads us to the tapes. The push for a settlement stems from several audio tapes recorded by women in conversation with Ailes. Judging by what Ailes has been accused of so far—harassing more than 20 women, hiring investigators to track journalists—we imagine whatever is on those tapes is quite damning. If there’s no deal and the lawsuit goes to trial, things will get even more messy for 21st Century Fox than they already are. It’s quite possible that other Fox News execs, who likely knew about Ailes’ harassment and didn’t do anything, could go down too. Ironic, isn’t it? Ailes, the very man who created the Fox News empire, could be the same man who tears the whole thing apart.